Before and After - A whole house! This pile of bags that was cleared from a large home in just one day. We didn't take any 'before' and 'after' photos as a first sight there didn't appear to be much to declutter. However there was lots - it was just hidden behind doors! In 6.5 hours we blitzed most of the house of any unwanted items - three bedrooms, an attic storage area, three people's wardrobes, and two bathrooms. So what is in the bags? Books, videos, children's toys, towels, bed linen, ornaments, clothes and shoes. 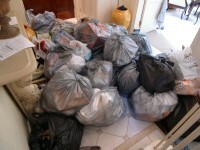 The grey bags were donated to charity while the few black bags are household rubbish. 'Isn't it just amazing' said the owner. Amazing indeed. Take our clutter quiz and find the areas of your life you need to declutter and organise!